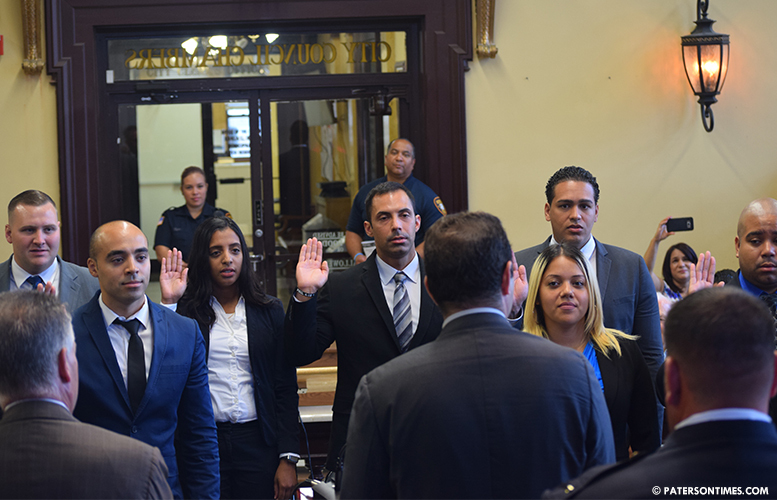 A dozen new recruits – five women and seven men – joined the Paterson police force on Monday morning. The new officers were sworn in during a brief ceremony at City Hall in presence of their family members and friends by mayor Andre Sayegh. Trust, integrity, and ethics were the keywords at the ceremony. Several police officers have been charged with violating Patersonians’ civil rights this year. “The times are a changin’,” said police chief Troy Oswald, quoting Bon Dylan, the Noble Prize-winning singer-songwriter, who wrote a song about Paterson. He has been changing the police force by going after corrupt and incompetent officers since his appointment earlier in the year. The new recruits will go through training at the Bergen County Police Academy, where they will learn the basics of policing. Each will be provided sensitivity and diversity training, important in a city with a majority Hispanic and black population, two communities that have come to mistrust police. Each will start with a $33,000 salary and generous government benefits; however, after few years of service, they can expect higher wages. The new officers will be deployed in November, said police director Jerry Speziale. Speziale invoked the Golden Rule and the categorical imperative to urge the new recruits to treat others as they would like to be treated themselves. The new class boosts the number of officers to 421, barely keeping up with losses. Police have lost members due to the FBI’s corruption probe, retirements, and one tragedy. “There is honor in that uniform. It’s what you do in that uniform that makes you honorable,” said Sayegh before having the recruits raise their hands to swear them in. Where arfe these clowns getting the money to pay these officers, I'm sure they will just raise the taxes again to cover more spending.